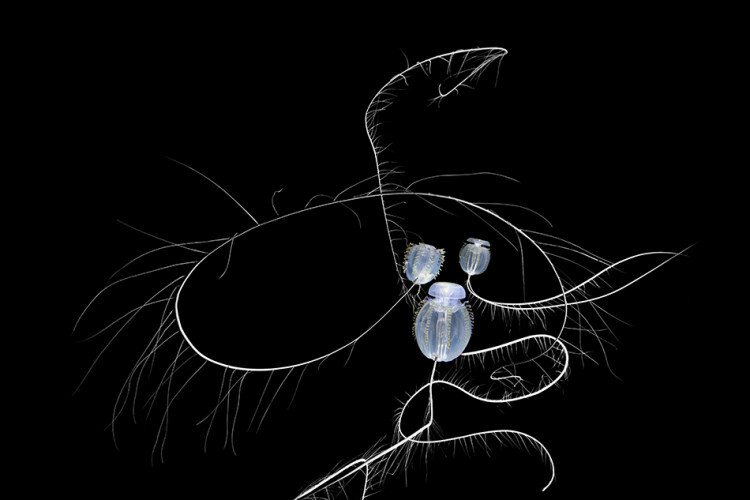 Lithoptera is a kind of plankton refered to in coomon terms this plankton is a “vegimal” in that though it is a single celled organism it operates like a vegetable photo synthasiszing light from the sun to create enery yet still operates like an animal in that it is a single celled organism that eats other plankton. Its structure or skelton is made of strantium a form of calicium carbonate and curiously it goes up and down the water colomn daily from the surface of the ocean to great depths and back again scientists have yet to know the reason for this behavior. 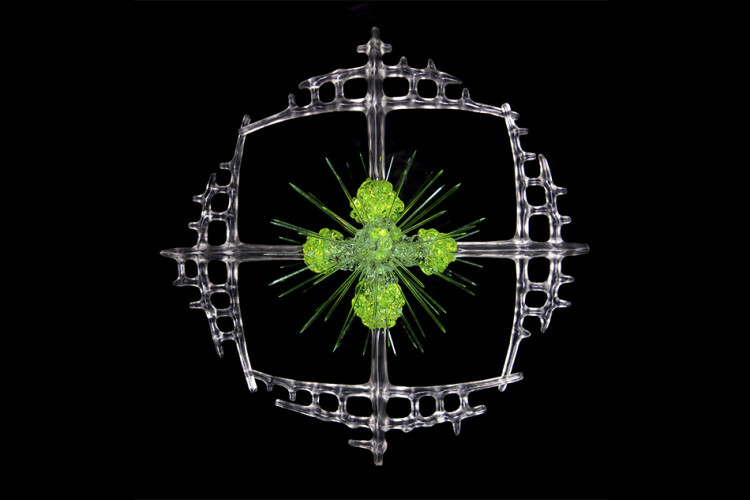 It was descouvered and studied by Tara scientist Colomban de Vargas and is the only plankton in this series that the artist has not captured herself and studied from life. 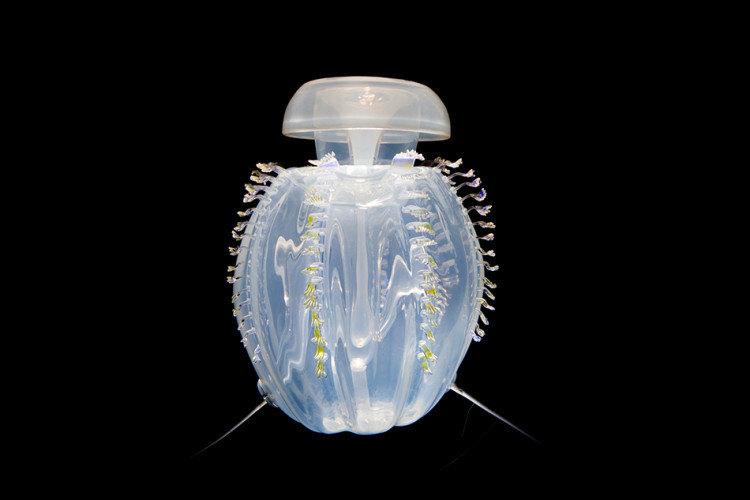 The ‘Ravenous Ctenephore Series’ was created based on plankton that the artist captured off the coast of Chile while aboard Tara Oceans. It was important for the artist to make this series showing not only healthy but ‘ravenous ctenephores’ after making the ‘La Boheme series’ because not everything in the ocean is sick and dying in fact some things are alive and well and even hungry like these ctenephores! Though this type of plankton proliferates all over the planet it is of note that the ctenpehores the artist captured had blood red tentacles which quickly faded to white when preserved behaps this was due to the rich mneral mix that is fed into the waters of the coast of Chile by the Humbolt current from Antartica. 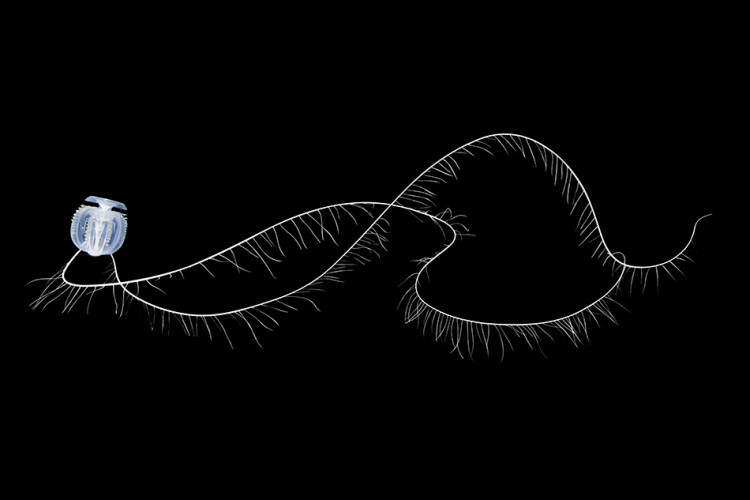 Ctenophora (tĬnŏf´ərə), a small phylum of exclusively marine, invertebrate animals, commonly known as comb jellies. Ctenophores are characterized by eight rows consisting of ciliated plates called ctenes (combs), which are radially arranged on the spherical body surface. The animals swim weakly, powered by those structures. 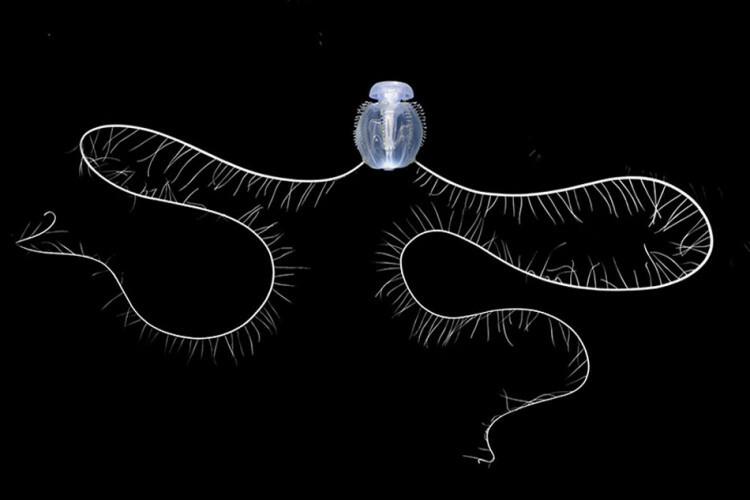 The two hemispheres of the ctenophore body are marked by a mouth, or oral pole, on the underside, and an opposite aboral pole, on which is located the statocyst, a unique sense organ controlling equilibrium. Most ctenophores resemble biradially symmetrical (see symmetry, biological) jellyfish (phylum Cnidaria) but lack the cnidarian whorl of tentacles around the mouth. They lack the specialized stinging cells (nematocysts) found in coelenterates, but one species (Haeckelia rubra) incorporates those of its jellyfish prey for its own defense. Ctenophores, which are all carnivorous, have specialized adhesive cells called colloblasts, used to capture planktonic animals on which the ctenophores feed. Approximately 50 species are known, but many become locally abundant and are ecologically significant. They vary from less than 1/4 in. (0.6 cm) to over 1 ft (30.5 cm) long. Most are transparent, but pale pinks, reds, violets, and oranges are also known in some species. Most ctenophores are also bioluminescent, the production of light originating in the walls of the eight canals. Most ctenostomes are hermaphrodites, developing through a cydippid larval stage to adults. They can also regenerate lost parts. Also they are cannibals devoring their own kind! 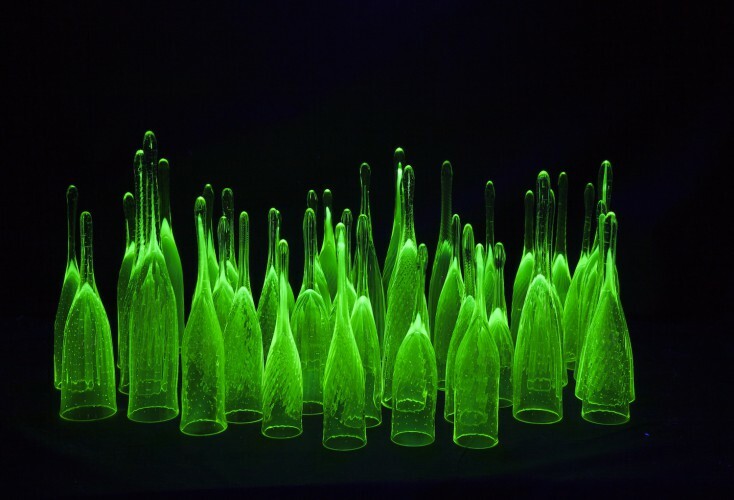 These glowing Tintinnid Champagne Glasses (2012) were inspired by the tintinnid plankton Haseltine observed while examining water samples from oceans around the world under a microscope. They are light-hearted pieces as the artist, enchanted by their fluted forms, likens them to champagne glasses for mermaids. 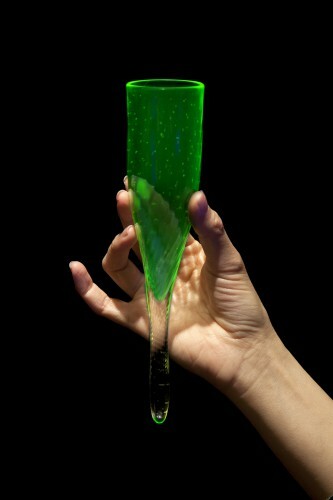 The tintinnids that inspired the Tintinnid Champagne glasses were collected during Mara G. Haseltine’s artist-in-residency aboard the research vessel Tara Oceans.